I met Char in the store when she was signing up for Sabiha Mujtaba’s Fundamentals of Woodworking class, a perennial favorite among woodworkers of all stripes. She told me about some of the projects she had finished for her family and fitting in her woodworking into an already full schedule. 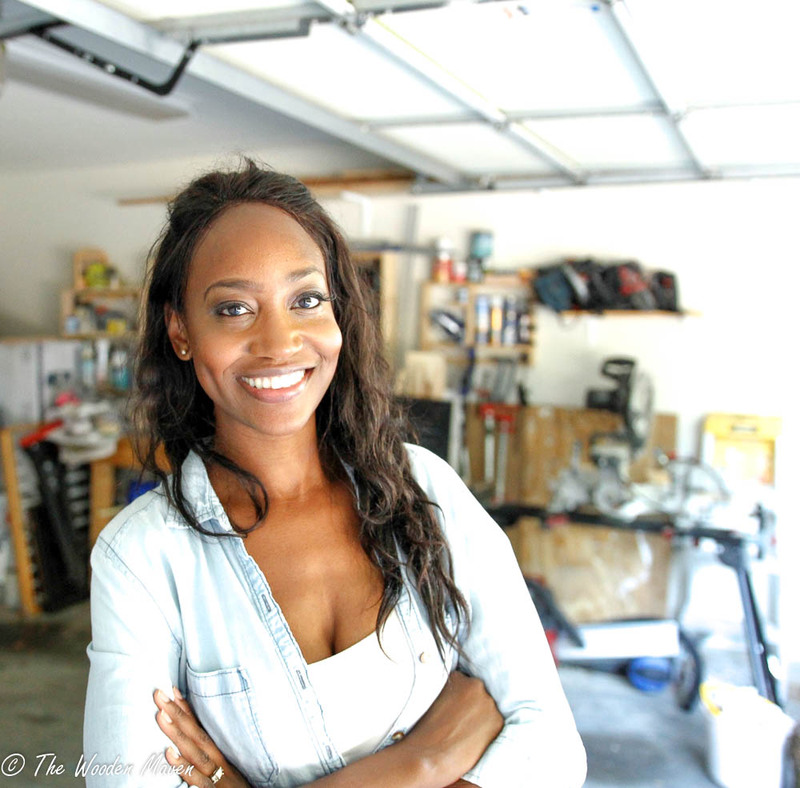 She invited me to check out her blog, the Wooden Maven, where I encountered not only an avid woodworker, but an inspiration. I began woodworking soon after undergrad when I moved into my first apartment. There was a platform bed I was interested in purchasing, at the time I could not afford it. I thought, perhaps I could build it. I didn’t have much direction to go on, YouTube was still in its developmental stage. After a few trips back to the furniture store to further inspect the bed, I drew my own plans, borrowed a drill, and purchased a ten dollar battery-powered screwdriver. It took me approximately three months to complete the bed… I believe that experience was the beginning of my love for building furniture. The gratification that came from producing something with my own hands was invigorating. That was back in 2003, since then I’ve been learning everything I can about my hobby-turned-passion. I always like to keep a few projects going at once. Right now I am working on two identical beds. They are twin beds that extend to king size beds. In addition [they have] accessible storage and non-accessible storage underneath. 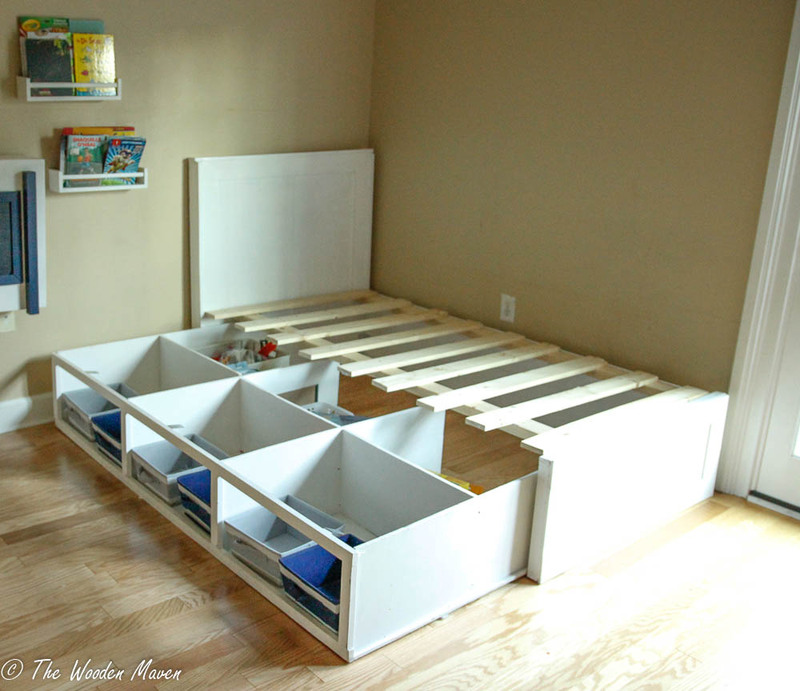 I needed the beds to serve several purposes: a place for my children, room for guests, toy storage, and of course storage for toys that shouldn’t be brought out every day. This was the largest project I constructed from only plywood. I used three-quarter inch PureBond plywood and a Kreg circular saw jig for rip and cross cuts. To give the bed a modern look, I used beadboard wallpaper on the headboard and footboard. To keep the beds as low as possible, I opted for furniture movers strategically placed on the bottom for easy gliding. Along with the beds, I am putting the finishing touches on a matching children’s fold down desk. I chose pine for this project since it is lighter in weight and an affordable option for a place that will see a lot of use. The tabletop of the desk is covered with a thin polyethylene sheet to make for easy clean-up of paint, markers, or pencil marks. Both projects are paint sprayed with semi-gloss paint and a coat of polyacrylic, a touch of blue paint is used to accent the desk and tie in the bedding colors. Lastly, I am working on a display case, in which I am using all the skills I learned in Sabiha’s woodworking fundamentals class. The case includes dadoes and the use of an ogee bit. It is made from oak and instead of glass to enclose any special object, I am using plexiglass. It will sit nicely on a mantle for many years to come. I know that I truly enjoy woodworking because I fall in love with almost every new tool I experience. The versatility of each of them and the possibilities are all endless. I recently took a hand plane class at Highland after purchasing my first block plane. I never knew that hand tools could be so involved, it was an eye-opening experience. Hand tools allow you to interact with the wood and have a closeness to it, that you don’t get with power tools. I have to say that hand planes are my favorite for now. Recently, I started turning and for someone who wants a finished project quickly, turning pens [is] the perfect answer. I do enjoy working with lathes and hope to get more involved in the world of woodturning. For sentiment’s sake, I still have the little Black+Decker screwdriver I built my very first project with, it no longer works. It is a small reminder from whence I came and a nod to staying humble in my craft. Great story and thanks for the inspiration!